Folks, I’m not a writer. In fact, I’m using modern technology to dictate what I’m saying into a microphone right now. But I felt compelled to put quill to parchment after seeing what I believe to be the future of sports, if not entertainment at large: eMLS! Yes the eMLS, or “emeels” as people pronounce it; the FIFA gaming league affiliated with Major League Soccer. It’s fast paced, digital, artisanal and a roller coaster of emotions. It was mid-November when FC Cincinnati announced they were joining eMLS, coinciding with our leap to the non-e MLS. Representing the team would be a young man named Gordon Thornsberry, better known to the world as Fiddle. Those of us not in the know were a bit flummoxed as to what this all meant, or how it related to our FCC fandom. I’m sure I had a few jokes at Gordon’s expense; simple words that will haunt me til my last breath. I did some quick research to learn what this league was all about, and how Fiddle would be going up against the best and baddest FIFA gamers, each representing an MLS club. Fiddle himself was plucked away from Paris St. Germain’s FIFA team, owned by Qatar Sports Investments. Fiddle had to have been counting his lucky stars to make it back to America, as the Qatari’s are known for withholding passports from migrant workers. But where is home for Fiddle, you ask? Well I learned he is a native of beautiful Oxford, Ohio. However if you’re picturing salmon shorts, polo shirts and Paul Ryan, you got this gamer all wrong. With a gentle strawberry blonde tuft of hair on his head and a pair of modern glasses, Fiddle is all business. Tuesday, January 22nd was the first event in the eMLS League Series One. Something with that many words in its title HAS to be important. Players from around the country flew to Los Angeles to take part. Fiddle had been out there a few days prior, coinciding with MLS media day. He was able to post a picture of himself with the greatest player to ever wear a Barcelona kit, Zlatan Ibrahimovic. This wasn't a sightseeing trip though, as Fiddle focused in on his qualifying rounds. Those games were unfortunately not streamed, shrouded in a cloak of secrecy unbecoming of eMLS. Lucky for us though, Fiddle qualified for the evenings live-streamed knockout rounds, where FCC fans could finally get a taste of the action. The Pride Slack channel had the energy of an FCC match day. E-gaming newcomers like me and veteran viewers alike geared up for the enormous task at hand. The Pride President Chris White gave a speech that made Kurt Russell’s in “Miracle” sound like the rantings of a lunatic. The hype level was off the charts. I know that I required several extra trips away from my computer to the bathroom, as the nerves had gripped my bladder. The tournament order was determined, and Fiddle was to be the third match on the broadcast. I was able to get a feel for competitive gaming with the first two games, featuring legendary e-ballers like Kid M3mito and future stud Skill Shack. The Twitch (live streaming video game platform) stream climbed up to around 40k viewers, causing me to instinctively look to my left and say “can you believe this?”. Of course, nobody else was in the room. Finally it was Fiddle time. The FCC supporters online beamed with confidence, but one thing bothered us slightly. After seeing a highlight from an earlier win, we noticed that Fiddle’s goal celebration did not include him mimicking the playing of a Fiddle. Hopefully top brass at FCC can get a hold of him and let him know he's truly missing out on a golden opportunity. Fiddle was matched up against NYC Chris, playing for NYCFC. Here is Fiddle, fresh off his PSG escape, once again forced to battle against Middle Eastern oil money. NYC Chris was the odds on favorite, with Fiddle given very little chance and even less respect. But it was quickly time to clean egg off of faces as Fiddle scored the opening goal, leaving NYC Chris flummoxed, confused, and grasping at electronic straws. Without an air fiddle goal celebration to completely bury Chris’ confidence, Fiddle left himself vulnerable. Expectedly, NYC Chris answered back with a goal almost immediately, tying things up. In my palatial home office, I clapped, groaned, yelped and cursed throughout the game. My five year old son was sound asleep one door over, and I thought about waking him for what would surely be a formative memory. Better judgement prevailed. Finally around the 70’ mark of the second half, Fiddle struck on a delicious counter attack, grabbing the lead, and never letting it go. NYC Chris struggled to make sense of it all, and took to Twitter to blame his loss on an internet LAG, mostly created in his head. A barrage of FCC supporters flocked to his account, pointing out his sour grapes and sore loserness. Embarrassed and dejected, NYC Chris deleted his tweets, and rightfully admitted his loss was fair and just. By then, something had happened. Something nobody could have expected. Not only did we watch this together as supporters; we truly cared. From the bottom of our orange and blue hearts, the defeat of NYC Chris felt very much like a victory on the hallowed grounds of #TheNip. The night wasn’t over yet though, and we watched the other matchups with a keen eye, awaiting Fiddle’s semifinal opponent. 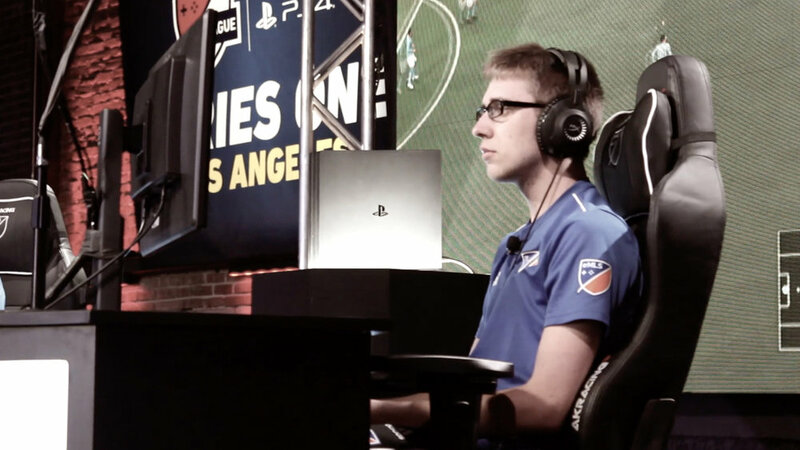 Storylines abounded, too many to name here, but all of us were quickly wrapped up in the soap opera of eMLS League Series One. When it came time for Fiddle to face off with a young Irishman named Doolsta, we had already meme’d the matchup and thrown our passion behind Fids. The outcome of Fiddle vs Doolsta is irrelevant at this point. Needless to say, NYC Chris may have had a point about the LAG he experienced. Doolsta was able to grab a few, borderline illegal goals against Fiddle in the first half… and the second half. But for all those who watched, Fiddle was already our champion. Tuesday had bled into Wednesday, with Fiddle’s match taking us past midnight, and the entire event started to feel like some remarkable dream. We had yelled, cursed, virtually high fived and excessively urinated, all for a video game. The old me (the one from a few hours prior) wouldn't have even recognized the new me. “I am an eMLS enthusiast”, I quietly said into the mirror of my dark bathroom. There was no going back. Those of us on Pride Slack took in the moment together, and commented on this brave new world we had entered. When you get a glimpse of the future, even for just one brief evening, you make sure to remember the feeling. This isn’t the last for me, The Pride, and eMLS. Far from it. This is the new reality, taking place, in virtual reality. Adi can score goals, but Fiddle can as well, from the comfort of a gaming chair, in a production warehouse in Los Angeles. That’s something special as well. Until next time, hold your sticks tight, and I’ll see you all on the web.